Humorist, novelist and social critic Samuel Clemens — best known by his pen name, Mark Twain, was in London, one of the stops on a round-the-world speaking tour. Someone started a rumor that he was gravely ill, followed by a rumor that he had died. An American newspaper had sent a cable to its reporter ordering him to send back a thousand word story about Twain’s death. The quote comes from Twain being shown the cable. So while he did pass away in 13 years later, we’re happy to announce he’ll be joining us at the Northeast Region Conference (through the magic of a very talented impersonator, Kit Webb.) Mr. Twain will share his inspirational insights and humor with us as we explore the Challenges of Cold Weather Construction in Hartford at the end of May. Mark Twain published 28 books plus several collections of short stories. Among them are The Adventures of Tom Sawyer, Adventures of Huckleberry Finn and of course that tale about The Celebrated Jumping Frog of Calaveras County. 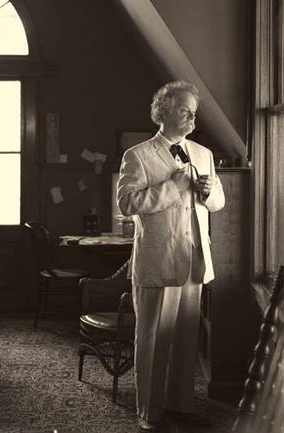 ESPN turned that last one into a short feature with Kit narrating and appearing as Twain. We hope you’ll join us to learn from Mark Twain as well as from experts in the construction industry. Explore the conference pages for details, and make your plans now.